It’s been a wild couple of weeks up here in the land of the hamburger hot dish, Governor Jesse “Ready-Fire-Aim” Ventura, and the hardest working team in baseball, the incomprehensible Minnesota Twins. What had been a fairly pleasant spring was wiped out by two days of ninety-degree weather, which pretty much took out the tulips, daffodils, and other spring bulbs blooming across our patch of Zone 4. I was dividing a few perennials the day after the heat wave and the soil was hot three inches down, hot to the touch, July soil. I should have watered just prior, to keep the soil temperature down. Then cool weather returned, and some much-needed rain, so who knows where we are in what season? The only thing I know for sure is that people buy the wackiest annuals. As I help people choose the annuals for their containers, window boxes, and gardens, I continue to be astonished by the popularity of Gerbera daisies. Granted, it’s a question of taste; I happen to prefer annuals that bear some mild correlation to the perennials with which they are combined. Gerberas just don’t fit, their ridiculously large, plastic blooms floating like spinning pie plates atop too-long, scandalously erect stems that vault from flopping waffles of the saddest, ugliest foliage known to botany. A table of them looks like sunflowers tripping in a field of Boston lettuce. I cannot conjure up a single spot on my half-acre where I could plant these South African Frankensteins and have them look as if they even remotely belonged. Of course, if you love Gerbera daisies, the Renegade thing to do is to buy and plant plenty of the little darlings, and to hell with me. Don’t let it affect you one whit that I find Gerbera daisies terrifying, unnatural, obnoxious, obese, garish, and grotesque. They don’t even look real; every time I pass by the tables on which they collude I don’t know which I expect more, to be sprayed by water, like a clown’s flower, or to hear the tallest of the bunch utter, “Feed me!” If Gerbera daisies were people, they would steal. I’m certain a Gerbera daisy is what the devil wears in his lapel when he comes to call. 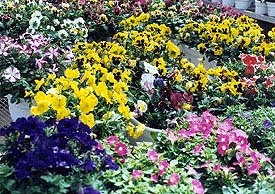 Buy annuals in a real greenhouse, grown by real annual growers. Those flats sitting on shelves out in the parking lots of grocery stores and home centers aren’t being tended to by plant people, they’re being neglected by plumbing experts and grocery baggers. Plants in these temporary hoop houses are often watered sporadically, many times only after someone finally realizes an entire quadrant of annuals has wilted. They may pop back and look good when you buy them, but these are weak, stressed-out plants. If you must buy from these places, never buy a flat of annuals that is sitting on the tarmac. Lord knows how hot those roots have been, at times. Check the plants carefully for signs of brown, shriveled leaves, and pests. Brown, shriveled leaves are signs that the plant has been allowed to dry out here and there while for sale. Even nursery center greenhouses can get pest infestations. Best way to check the overall pest potential in the greenhouse you’re shopping is to check the pepper plants. 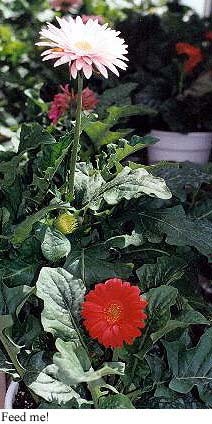 If the pepper plants are pest-free and looking good, the annuals are pest-free. Get what you pay for. If buying flats, pull out each little cell-tray, and check to make sure each cell has a healthy plant in it. Rarely will you find a flat that contains the requisite number of plants, even in good greenhouses. Go ahead and pop the soil out of an empty cell, or any cell that contains a less-than-satisfactory specimen, and replace it with a good plug from another flat. Ask if you don’t find what you are looking for, or if one type of annual appears to be down to the last dregs. Folks at the greenhouse where I’ve been working will cheerfully go back into the growing houses and pull some fresh annuals out for you. Taller is not better. Whenever you have an option, choose the flat or pot or container or basket that has the stockiest growth, fullest leaves, and least amount of bloom. And if you do decide to try Gerbera daisies, lock your doors at night.